Following are 2 block categories for selecting easy blocks. The first is 'Very Easy' where if you can sew a straight line then you can make all these blocks. Each block is created using a small number of pieces. The second category is 'Easy' that adds sewing triangles into the selection. Here the patterns have a few more pieces in them. Making simple blocks doesn't mean your quilt will lack interest or be boring. They often allow a quilter to use the more patterned fabrics to add interest. 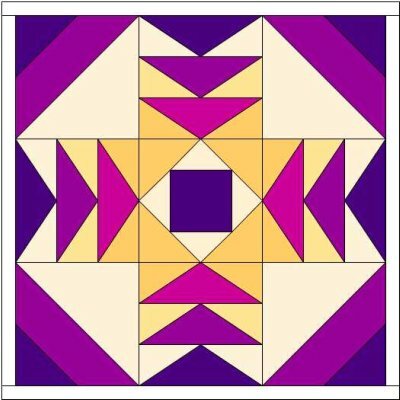 The quilt above has been designed using Electric Quilt 7 (EQ7) a software programme I highly recommend. I used 3 of the easy blocks to show you that simple blocks can make very interesting designs. This is an inspiration only design - there are no instructions for this quilt. * Precut strips in jelly rolls make sewing blocks super quick and easy. Jelly rolls are a complete selection of a manufacturers fabrics - this means they can be used together and will look fabulous.